Plants make the best mulch; that was the inscription Claudia West wrote in her new book for me after a recent talk. She is one of the new breed of landscape designer creating native perennial plant community plantings without wood mulch around the plants for protection. 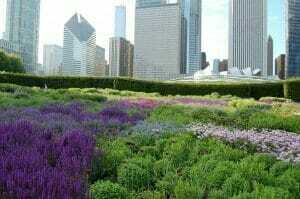 Creating more natural perennial plant communities in the typical landscape design is a new challenge for us as landscape designers. Laura and I were attending an ELA symposium at the Brooklyn Botantic Garden and Claudia was one of the speakers. We had seen Claudia speak at the industry event New England Grows and then decided to attend the symposium also. Continuing education is a huge part of our profession as landscape designers. The industry has evolved dramatically since I began my career in 1987. New plants, new techniques, and new information resulting from decades long studies are changing the way we look at our landscapes. I have heard murmurs for years regarding gardeners and designers deciding to not use wood mulch in perennial beds. What about weeds? What about water conservation I thought? I have to say I dismissed the idea. I have met many a client that is sick and tired of purchasing and spreading endless cubic yards of mulch on their property. More than a few have decided to remove all of the mulch and install rounded stone or gravel since it does not degrade. And yes, wood mulch may not be the best solution in all of your landscape beds. GRAVEL AND STONE ARE NOT THE SOLUTION I AM WRITING ABOUT! Although a stone “mulch” looks very neat and tidy it does almost nothing to protect plant roots from extreme cold or heat. Soil and debris quickly build up on the landscape fabric and weeds appear, forcing the maintainers to use herbicides for control. Nor am I a huge fan of landscape fabric. Geotextile fabrics play a crucial role as soil separators in hardscape and drainage systems but smother the living soil, encouraging molds and restricting plant root and beneficial insect movement. 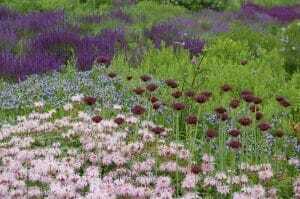 What I am talking about is trying to design perennial plant communities and not simply an arrangement of plants. In a natural ecosystem such as a meadow or prairie we see low groundcover plants nestled around the “feet” of taller, more structured plants. It is a symbiotic relationship where they protect the roots of the larger plants, prevent intrusion of non native weed species, and gain some beneficial shading from their taller neighbors. Here in Albany’s Capital District we are starting to see the use of more native perennial plants. 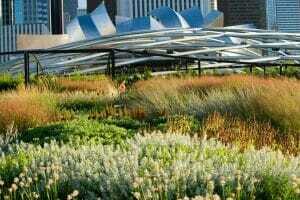 Laura and I have tried to bring natives to many of our pernnial design projects but it is hard to convince clients to have a meadow or prairie as their landscape. We certainly understand that this “messy” look is not for everyone. But we will be striving to create more natural (and lower maintenance) plant communities that don’t use mulch and are beautiful in all 4 seasons. Take a look at our portfolio where we are just starting to have native plant projects to show.